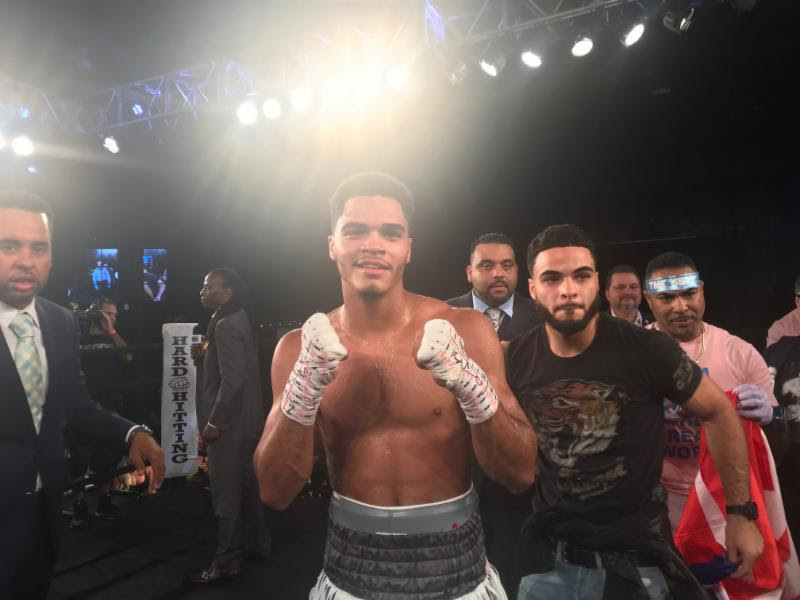 19-year-old junior welterweight prospect, Branden “The Gift” Pizarro, is looking to impress a sold-out crowd this Friday night at The 2300 Arena when he takes on Jerome Rodriguez in a six-round bout for the NBA Intercontinental title. The bout will precede a ShoBox: The New Generation card that airs live on SHOWTIME (9:35 PM E.T / P.T). In the main event, undefeated welterweight Jaron Ennis (21-0, 19 KOs) takes on Raymond Serrano (24-5, 10 KOs) in a ten-round bout. In the co-feature of Friday’s live telecast, ShoBox veterans Kenneth Sims Jr. (13-1-1, 4 KOs) and Samuel Teah (14-2-1, 7 KOs) meet in an eight-round super lightweight bout. Undefeated Ukrainian Arnold Khegai opens the three-fight card when he takes on New Jersey’s Jorge Diaz (19-5-1, 10 KOs) in an eight-round super bantamweight bout. Pizarro, of Philadelphia, is one of the top prospects in his weight division and has been preparing for a pinpoint performance. “Camp was great. We had a full, six-week camp after my last fight, which took place on October 6th. I am ready for Friday,” said Pizarro. In Rodriguez, he is facing a battle tested fighter who has opposed 10 undefeated foes, including Pizarro’s Hard Hitting Promotions stablemate Jeremy Cuevas in his last bout, which also took place on the same October 6th card. With an expected sold-out crowd on hand in Philadelphia, Pizarro goes about his business to look good no matter what the stakes are. But being featured on television in the future is not the most important thing at this stage of the young prospect’s career. Gadwin Rosa (8-0, 7 KOs), of Ocala, Fla. takes on 113-fight veteran German Meraz of Sonorea, Mex. in a six-round battle for the NBA Intercontinental title. Kieran Hooks (3-1-1, 1 KO), of Philadelphia, will fight Gledwin Ortiz (5-2, 4 KOs), of Bronx, N.Y., in a welterweight bout. Christian Tapia (6-0, 5 KOs), of Coamo, Puerto Rico, fights Darnell Pettis (3-12), of Cleveland, in a super featherweight contest. Light heavyweight Benny Sinakin (1-0), of Philadelphia, will face Darren Gibbs (1-5, 1 KO), of Ferndale, Mich.
David Stevens of Reading, Penn. will make his pro debut against Dustin Long (0-1-2), of Johnson City, Tenn. in a cruiserweight battle. Also seeing action against an opponent to be named will be super bantamweight Angel Pizarro, of Philadelphia.